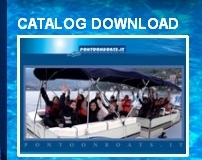 High performances PONTOON BOATS for both salt and fresh water. Made for professional and entertainment use, i.e., working, fishing, diving, tourism, etc., These boats can be customized to meet any requirement. We also offer a large selection of options. The draft is lower than 25cm and even less on a three-ton guaranteeing higher performance and greater stability. We offer durability, comfort and style on a boat built for high-load capacity.